Mad Bibliophile: Blogging about books and bookish things. Another birthday past this weekend and I turned yet another year older (as one generally does when one has a birthday). To spoil myself, I gave my credit card and the various book stores a good work out and added to the increasingly overwhelming TBR pile! It’s Raining in Mango by Thea Astley. Beautiful Creatures by Kami Garcia & Margaret Stohl. This was a free promotional copy that Penguin sent for signing up to their blog. An Accommodating Spouse by Elizabeth Jolley. Picked this up at the book market. Let’s Kill Uncle by Rohan O’Grady. Mrs Ames by E. F. Benson. Elizabeth and her German Garden by Elizabeth von Arnim. The Mayor of Casterbridge by Thomas Hardy. Aurora Floyd by Mary Elizabeth Braddon. This one came from Book Depository quite squished. Not too happy about that. The Dead Secret by Wilkie Collins. The Woodlanders by Thomas Hardy. Building my Hardy collection quite nicely! Kitchen Essays by Agnes Jekyll. Someone at a Distance by Dorothy Whipple. Ah, my first Persephones! I love this loot but I have no idea when I’ll get through them. There are twelve books there and if I read an average of one a week, I’ll need three months. Ah well. Now all I need to is to go get that darn bookshelf. Happy Birthday Mae! Seems to be many August babies in the book blogging world. 🙂 And what a lovely pile of books to boot! Hope you had a brilliant birthday weekend. Thanks Jess! There’s seems to be a lot of August babies everywhere! There’s been so many birthdays lately. Happy birthday! Nothing more satisfying than getting more books! I don’t think I’ve read Collins’ The Dead Secret. Happy Birthday! What a wonderful load of books you have to enjoy! Nothing better than celebrating your birthday than by having a bit of a book splurge. Hope you had a great day! Happy Birthday! I LOVE Elizabeth and Her German Garden and the rest of the loot looks wonderful too! Belated birthday greetings. I have been very keen to read the book Lets Kill Uncle!! would like to see what you think of it. Thanks Bellezza, but I’ve already started reading it! I couldn’t wait. I’m really enjoying it though. Happy Birthday! I’m interested in the Braddon. Not heard of that title. Happy belated birthday! I envy you Aurora Floyd and the Bloomsbury and Persephones 😛 Enjoy your loot! Belated birthday wishes Mae. Great choice of books! Oh dear, I missed this one too. Where have I been? Anyhow, what a lovely loot. 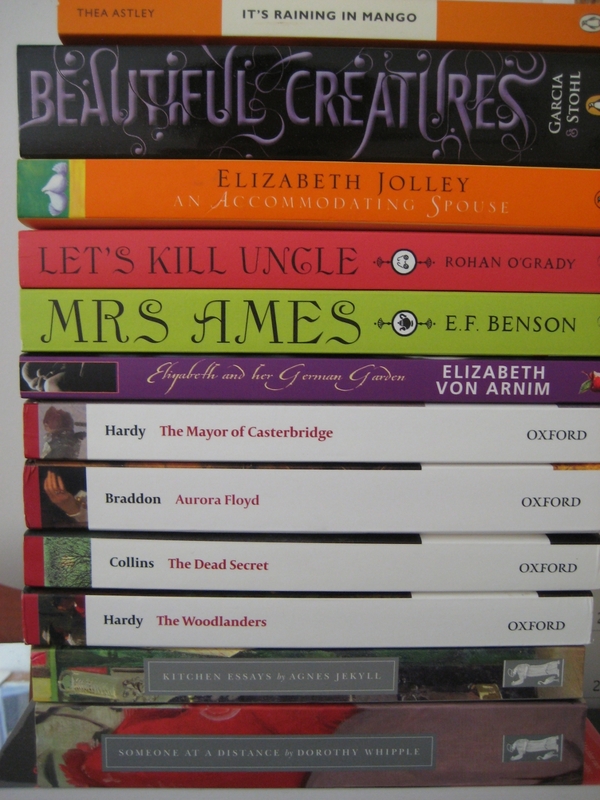 Great choices – particularly the Astley, the Jolley and the von Arnim. Have you got going on any of them?